There are some games you never thought you'd see made. Not necessarily because it's bad, but just because you never would have come up with the idea in a million years. Developer Neon Deity Games has had one such idea. 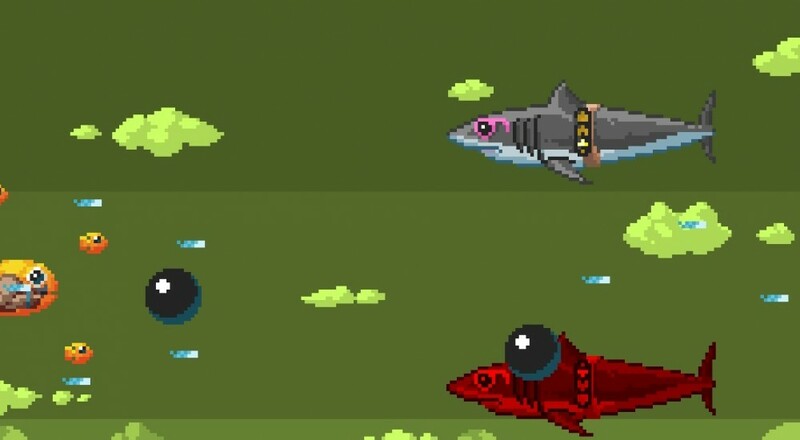 In their game, Shutshimi (pronounced "shoot-shimi"), you play as a fish with big muscles and a big gun. Yep. So why a fish has muscles and a gun is probably best left up to your imagination. The better question is, now that you find yourself as a fish with such benefits, what do you do with them? The most obvious answer is to defend the seas in a 'shmup style action game. The main features of the game are highlighted below, but the one we're most interested in is the four-player local co-op action. Sometimes, one fish with a shotgun ain't enough, ya know? 5 different, upgradeable weapons to choose from! Over 30 upgrades to collect! Combine upgrades with different weapons for interesting combinations! The game actually saw a PC release, available through the developer's website. last year, but they've now teamed up with BIT.TRIP developer gone publisher Choice Provisions to push the game out to even more platforms, like Wii U, Steam, PS4, and Vita. The release trailer from last year highlights some of the intense fish shooting action you can expect in the next few months. No set release date for the game has been announced, but it should be available on the aforementioned platforms sometime between April and June. Page created in 1.0635 seconds.